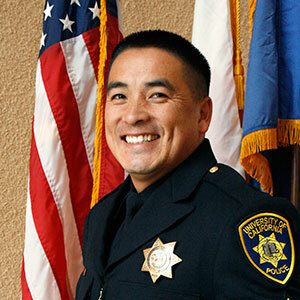 The University of California, Merced, announced today (April 12) the appointment of Chou Her to chief of police, effective immediately. Her, the first person of Hmong descent to lead a UC public safety agency, brings nearly two decades of law enforcement experience and years of demonstrated leadership. He has served the UC Merced community since the campus opened in 2005 and will continue to serve students and staff and faculty members as the campus’s third police chief. Her has served as interim chief twice — after the departure of Associate Vice Chancellor for Campus and Public Safety and Chief of Police Albert Vasquez in September 2016. He also stepped in as interim chief when founding Chief of Police Rita Spaur retired in 2015. Her has extensive police and emergency management certification and a demonstrated commitment to community involvement. He was promoted to lieutenant in 2011 and captain in 2015. Her was born in Laos, and his family moved to the United States when he was 3. He has lived in Merced for most of his life and has built a strong connection with the campus and the local community. Before joining UC Merced in 2005, Her was a deputy sheriff for the Merced County Sheriff’s Department for five years and a probation officer for Stanislaus County for nearly a year. He earned received an associate’s degree in administration of justice from Merced College and a bachelor’s degree in criminal justice and a master’s in public administration from California State University, Stanislaus.